Landscaping stones receive constant exposure to the elements in any garden setting. This decorative landscape material can become discolored over time with dirt and plant debris that alter the original color of the stone. Homeowners install landscaping stones to limit the maintenance typically required from organic mulches or wood edging materials. Any landscaping product will require cleaning at some point to brighten the material and increase the home's exterior appeal. Sweep up all plant debris around the landscaping stone and place in yard waste bags. Tidy up mulched garden surfaces using a rake to pull buildup away from landscaping stones. Use a leaf blower to remove stubborn or excessive amounts of plant debris and dirt from larger areas. Blow everything to one location for later disposal in the compost pile. Some leaf blower models have a bag attachment to allow the machine to convert to a vacuum. Use this to aid in the initial cleanup of the landscaping stones. Attach an adjustable sprayer to the garden hose and turn on full water pressure. Rinse the stones using high water pressure to remove dirt and small plant debris. Use the utility broom to scrub the surfaces to remove tough stains and perform a final rinse to determine the cleanliness of the stones. Remove tough stains using a hand-held scrub brush. Moss, dirt and organic material build up on landscaping stones over time. This changes the color of the stones to a weathered patina that isn't always unattractive. Tackle larger and dirtier jobs using a power washer. Choose a wide-angled wand for power washing the landscape stones and provide plenty of distance between the sprayer and stone to limit incidences of flying rocks. Follow safety recommendations and remember that debris will fly everywhere with the high-pressure spray. Work in a regular pattern from top to bottom and side to side to thoroughly clean the landscaping stone. Perform a final rinse with the garden hose to remove mulch and leaves from house siding and plants. Thin layers of inorganic mulch often result in exposure of the soil lying beneath the protective layer. 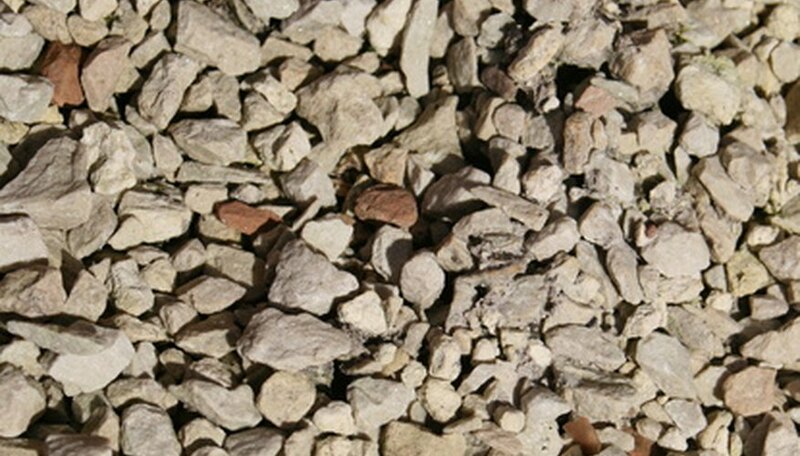 Adding another inch of gravel will often prevent dirt from escaping the garden and staining the landscaping stones.